"Sweet dreams are made of these..." Yea, these cupcakes are that good! My little guy asked to make chocolate cupcakes today and since we both love Nutella I figured why not go for something special?!?! Honestly, is there a more perfect combination then chocolate and peanut butter??? Nutella is one of those things that I am in love with. Jack and I enjoy dipping animal crackers into Nutella as a little snack! Another amazing use for Nutella, slathered in crepes with sliced bananas... heaven and yea I was lucky enough to have it in Nice France along with a Cafe au Lait!!! Ok, I digress... back to the cupcake...These cupcakes are wonderfully moist, perfectly sweet and topped with a simple and delicious frosting! 1. Oven at 350 degrees. 2. In a small bowl combine the flour, salt, baking powder and cocoa powder. 3. In a large bowl, using an electric hand mixer cream the sugar and butter. Mix until light and fluffy. Add the Nutella and mix until well combined. Next mix in one egg at a time until combined. 4. In a measuring cup mix the milk and vanilla. To the large bowl, with the mixer on low, add in half the dry mix, combine. Add half the milk mix, combine. Add the remainder of the dry mix and finally the remainder of the milk. Mix well until the batter is smooth and creamy and a light chocolate color. 5. Place liners in cupcake pan and spray with non stick butter spray. Fill the liners 3/4 of the way up. Bake for approx 15 minutes. To check doneness insert a toothpick, you want it to come out with a little bit of the cake on it, not completely clean! It will continue to cook slightly after you remove it. If you over bake them they will become dry so be sure to check them a little early as every oven cooks differently. 6. Remove the cupcakes from the pan and cool on a cooling rack. 7. If I had more Nutella I would have smeared a thin layer over top the cupcakes once they were cooled. 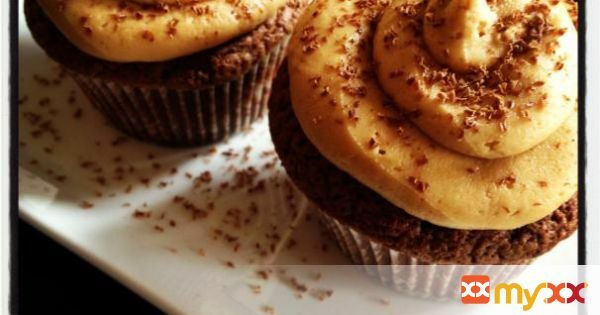 On top of that, pipe on the Peanut Butter Frosting (recipe below). Finish off with shaved chocolate. 8. For the frosting : In a large bowl, using an electric hand mixer, cream the butter and peanut butter until well combined. Add confectioners sugar until well combined. Finally add the milk until well combined. The frosting should be creamy, smooth and light in color.